The Great American Store microfiber sheet set adds a wonderful dose of cozy to any well-made bed. The silky-soft sheet set makes a nice choice for a kid's bedroom, a college dorm room, or for a first-time apartment. It can even be used as a fresh set for overnight guests or as a handy backup set on laundry day. 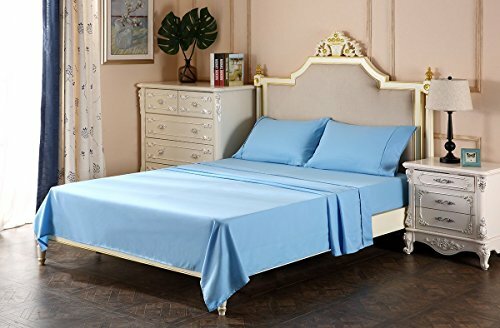 HIGHEST QUALITY - This bed sheet set is made of the best quality microfiber materials, double brushed on both sides to increase ultimate luxury and softness. With years of experience, we understand that to be comfortable in bed is very important to create a pleasant, calm, and peaceful night sleep. Deep pocket fitted sheet for deep mattress of 21 inches, with an elastic all around the sheet. Pure luxury hotel spa like feel. SPECIAL EASY CARE AND SUPER COOL. - Fade, stain, shrink and wrinkle resistant. Machine washable in cold, dries quickly on tumble dry low temperature. Tip: Remove promptly from dryer, place right away on bed, it will look beautiful and neat, like ironed sheets. 100% SATISFACTION GUARANTEE - With purchasing our Angel Bedding Products, you become a part of our family and you are automatically enrolled in our 100% satisfaction guarantee program. If you have any questions about this product by The Great American Store, contact us by completing and submitting the form below. If you are looking for a specif part number, please include it with your message.